In the brave new world of defamation relief on the Internet, Catholic University fourth-year law student Nantz Rickard says it’s time to rethink how things are done. “Current First Amendment jurisprudence and defamation law also do not clearly address the newly expanded Internet world of publishers,” says Rickard. 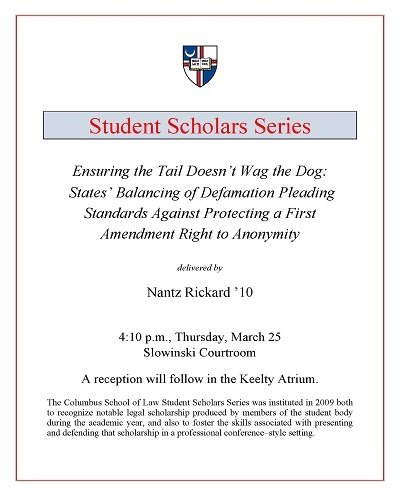 Her March 25 lecture, “Ensuring the Tail Doesn’t Wag the Dog: States’ Balancing of Defamation Pleading Standards Against Protecting a First Amendment Right to Anonymity,” relied for its arguments on the slim body of court jurisprudence that has dealt with the issue so far. Rickard, Nantz, "Ensuring the Tail Doesn’t Wag the Dog" (2010). Student Scholar Series. 1.